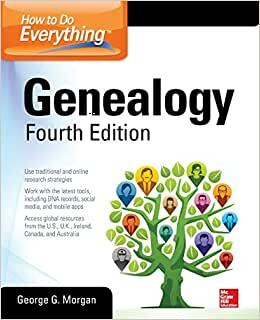 Thoroughly revised to cover new tools, techniques, and data, How to Do Everything: Genealogy, Fourth Edition uniquely addresses all the major genealogical record types and explains traditional and digital researchstrategies. Genealogy expert George G. Morgan shows you how to research your family history using the most current websites, mobile apps, social networking sites, record archives, census data, digital records, DNA research, and more. Discover your familys past with help from the new edition of this bestselling guide. Start reading How to Do Everything: Genealogy, Fourth Edition on your Kindle in under a minute. George G. Morgan is president of Aha! Seminars, Inc. In addition to his extensive responsibilities with Aha! Seminars, Inc., George is an avid genealogist. His interest began at age ten when he and his paternal grandmother and aunt divulged his paternal history extending back before the American Revolution. In the years since then, George's genealogical research has expanded to include all the branches of his family tree and he has investigated leads in materials in all sorts of places. Libraries, archives, and courthouses are among his favorite haunts, but he will leave no stone unturned, even to the point of tracking down the original 1914 newspapers containing his great-grandparents' obituaries in a records retention facility owned by a county board of education. He is a master in working with and understanding all types of genealogical record types in the U.S., Canada, the United Kingdom, and Australia. With the advent of electronic research materials, he has become an recognized expert in using software programs, databases, Internet resources, online databases, Internet genealogical mailing lists and message boards, search engines, directories, subscription databases, and all the major online services around the world. George is the author of seven landmark genealogy books. These include: The Genealogy Forum on America Online: The Official User's Guide; the award winning Your Family Reunion: How to Plan It, Organize It, and Enjoy It, both published by Ancestry Publishing. His award-wining book, How to Do Everything with Your Genealogy, published by McGraw-Hill as part of the highly successful "How to Do Everything" series, is now available in the fulluy updates SEcond Edition. This book is one of the best-selling genealogy "how-to" genealogy books published in the last 20 years! George has also written the first and second editions of The Official Guide to Ancestry.com. His Genealogical Research in the Major Repositories of London, published through Lulu.com (http://www.lulu.com), a print on demand publisher, has sold hundreds of copies. George is a prolific writer in other areas as well. He began in 1996 by writing the award-winning weekly online genealogy column, "Along Those Lines ..." that appeared first in the Genealogy Forum on America Online and then exclusively at the Ancestry.com Web site from January 2000 to March 2006, and additional columns for Ancestry Daily News. He also appears weekly in the Plus Edition of Eastman's Online Weekly Newsletter (at http://blog.eogn.com/), at the bi-monthly electronic genealogy magazine, Digital Genealogist Genealogist (at http://www.digitalgenealogist.com/), in the Ancestry Weekly Journal at Ancestry.com, and at other online venues. He has written literally hundreds of articles for genealogy print magazines: Ancestry Magazine, the Association of Genealogists Quarterly, Discovering Family History, Everton's GenealogicalHelper, Family Chronicle Magazine, Family Tree Magazine, the Federation of Genealogical Societies FORUM, Genealogical Computing (published by Ancestry Publishing), Heritage Quest Magazine, Internet Genealogy, the NGS News Magazine, and Southern Queries Magazine. His other online venues over the last decade have included Sony Communications' Emazing.com "Genealogy Tip of the Day" and a stint with ChineseRoots.com. George is a popular speaker at international genealogical conferences and has presented all across the United States in national, state, and local conference. He also has presented in Canada, in the U.K., and on several international genealogical cruises. His range of genealogical interests and speaking topics is among the most diverse among the genealogical speaking community. He is available to travel anywhere and will customize presentation topics to the audience. His genealogical presentation topics can be found in the current catalog at http://ahaseminars.com/AhaSeminarsGenealogyCatalog-2008-2009.pdf. (His current library continuing education topics also are available at http://ahaseminars.com/AhaSeminarsLibraryCatalog-2008-2009.pdf.) George is a past president of the International Society of Family History Writers and Editors and a former director of the Genealogical Speakers Guild. He is currently a director of the Florida Genealogical Society of Tampa and the Public Relations Chair and Publicity Director of the Florida State Genealogical Society. He is the list administrator for the MONFORT-L genealogical research mailing list. He was program chair for the highly successful Federation of Genealogical Societies 2003 Conference held in Orlando, Florida. He is a member of many genealogical societies in the U.S. and the U.K. Please contact George for more information about Aha! Seminars, Inc., presentation topics, consulting services, and about presenting for your genealogical society. He can be reached at aha@ahaseminars.com and/or at 813.205.3032. My favorite genealogy how-to! I've been doing genealogy for 1/3 of my life and I've read earlier editions of this book, but on re-reading this edition I still found many new things to learn. I shared what I learned with a public forum, and many other experienced genealogists agreed that they didn't know tips I learned from this book. It's very easy to read, very enjoyable. Only half way through this rather thick book, but it has already greatly increased my genealogical knowledge and prowess. Well-written by a well-known expert. Can't go wrong buying this book if you are learning genealogy. 4.0 out of 5 starsA good place to start. Simple to read and gives some very good suggestions on organization. That part is pretty important as I'm finding out. Excellent book, great solid research tips and information for genealogical research for the layman or beginner, and on up.